Time to introduce what I've been working on for these past too many months..
Branchable is an Ikiwiki hosting site, making it very easy to create blogs and wikis. The name "Branchable" was chosen because with its git backend, and ikiwiki-hosting frontend, sites hosted there can be easily branched by their owner (or by anyone, if the owner allows). The ability to take your data and configuration and go home, as well as everything being free software, means Branchable follows the vision of the Franklin Street Statement on Freedom and Network Services, like identi.ca and last.fm. This is very important to me and to my cofounder, Lars Wirzenius. 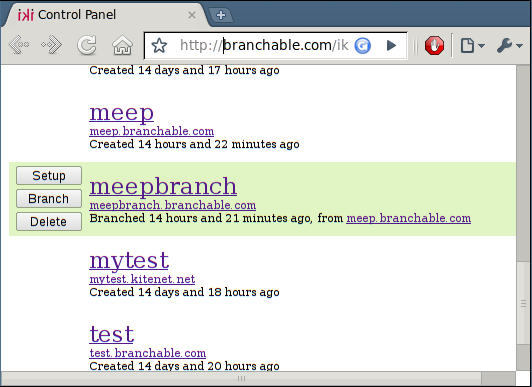 Branchable has a one month free trial, so if you've been meaning to do something with Ikiwiki, I hope you'll sign up. Also, we are offering free hosting for Free Software projects that sign up while Branchable is in beta.